Form huge balls with large tubercles and long, arching spines. The flowers are white or clear pink whit a darker pink throat. Origin and Habitat: Argentina only in an area near Tilcara. 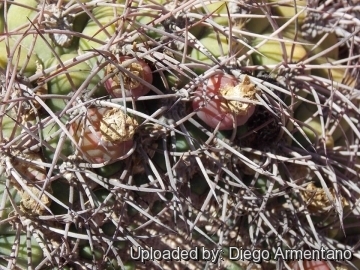 Description: Gymnocalycium saglionis subsp. tilarense differs from subspecies saglionis in having flowers with shorter floral tubes and occurring only in an area near Tilcara. The typical Gymnocalycium saglionis (commonly known as the "Giant Chin Cactus") is a solitary barrel cactus, rather flattened, often very large, with long spreading and sometimes recurved spines. Stem: Flattened globose to shortly cylindrical more or less flattened up to 30 (40) cm in diameter, 15-30 cm tall occasionally up to 90 cm tall, dull-green or blue-green. Central spines: 1-3 almost straight. Flowers: Broadly funnelform, white or pale pinkish, with reddish throat up to 3-4 cm long, 2-3 cm in diameter, with a very short flower’s tube. ; inner perianth-segments spatulate, acute; scales of the ovary nearly orbicular, rounded, with a scarious margin. The flowers forms a crown on the plant apex and have a hard time coming through the dense mass of spines. Cultivation and Propagation: Gymnocalycium bruchii is a summer grower species that is easy to cultivate. It is one of the most cold-tolerant South American species. It can grow outdoors and is hardy to -15° C or even less. Watering: Needs moderate to copious waterings in summer, but do not overwater (Rot prone), keep dry in winter. Hardiness: Reputedly very resistant to frost if kept on the dry side prior to, and during, cold weather (hardy to -15 C ° C, or less for short periods). Exposition: The plant tolerates extremely bright situations but enjoys filtered sunlight or afternoon shade, inside it needs bright light, and some direct sun. 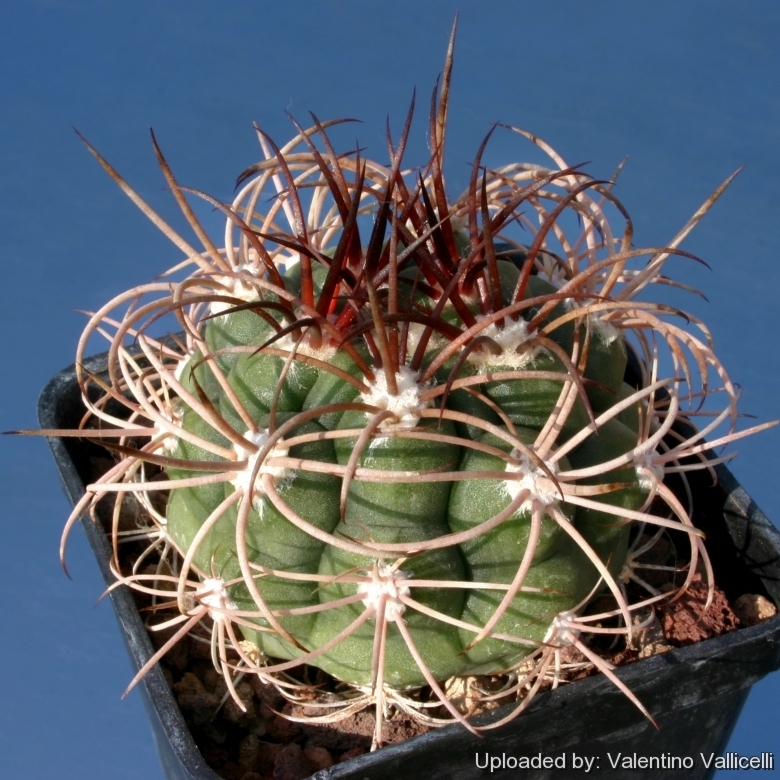 Tends to bronze in strong light, which encourages flowering and heavy spine production.